We opened at our current address - St. Eriksgatan 101 (Vasastan, Stockholm) in March 1997. 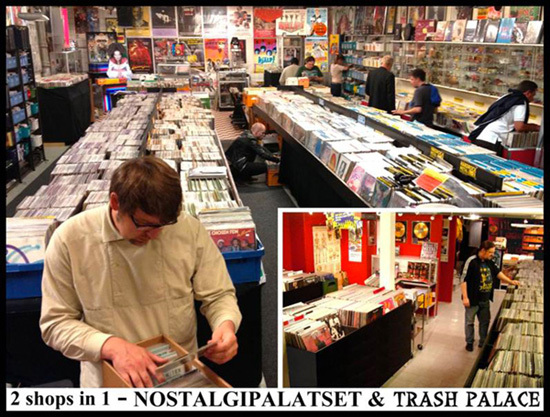 We are the largest in Stockholm to sell vintage records (vinyl ONLY) old toys, movie posters and other related memorabilia and collectibles. We have satisfied customers all over the globe and with our website we aim to attract further more potential customers. Whether you are new to us or a customer already we want you to always feel welcome. We are also running, since Sept 2015 an additional store; STOCKHOLMS SKIVBÖRS which is just a few minutes walk away from Nostalgipalatset - on Upplandsgatan 47 (at T-stop Odenplan). There we mainly sell CD:s, both NEW and SECONDHAND but offer a pretty extensive selection of VINYL albums too. Here we also specialize in a, and constantly growing stock of vintage SOUL / FUNK / DISCO etc. 45:s.
Well worth a visit with a basically completely different stock than our main store! We work hard to provide both "classics" as odd and / or unknown treasures. We have the ambition to offer the widest range you can find. On our website we particurlarly aim to offer an ever growing selection of really rare, desirable and unique items within our special field of interest. haven´t yet have had time to remove it from the range online. We apologize for any inconvenience should it affect you. As record shop assistants we are of course, dedicated to our music (and other items we offer). Our selection and / or guidance notes on some items can be coloured by our personal opinions (tastes). If there is anything you wonder or lack in supply of - please just contact us. Nostalgipalatset is open around the clock on the web. Metro St. Eriksplan(upper entrance), an approx. 200 meters walk upwards on S:t Eriksgatan as you exit.